Dance classes at Alanna’s Theatre and Dance Studio are of a recreational nature. We pride ourselves on offering top quality Dance instruction and education without the stress and pressure of examinations or competitions. 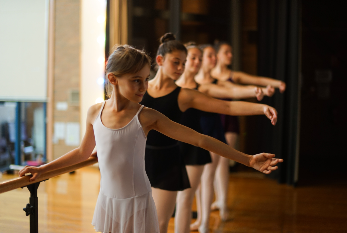 Classes are aimed for the beginner student or for those older students who have dabbled in dance in their younger years and would love to return to the studio in a safe and nurturing environment. We aim to provide a fun and relaxed atmosphere, nurturing each student’s individuality to build their confidence, love and appreciation for Dance. We focus on the fundamentals of Dance in a fun and exciting way, encouraging imagination and offering the opportunity for self-expression. Classes contain an educational element on top of the practical skills taught and students will engage in activities to foster their creative expression, problem solving, risk taking and higher-order thinking skills all while having a great time. Dance and theatre classes for children and teens. Adult classes available here. For class timetables please contact Alanna.